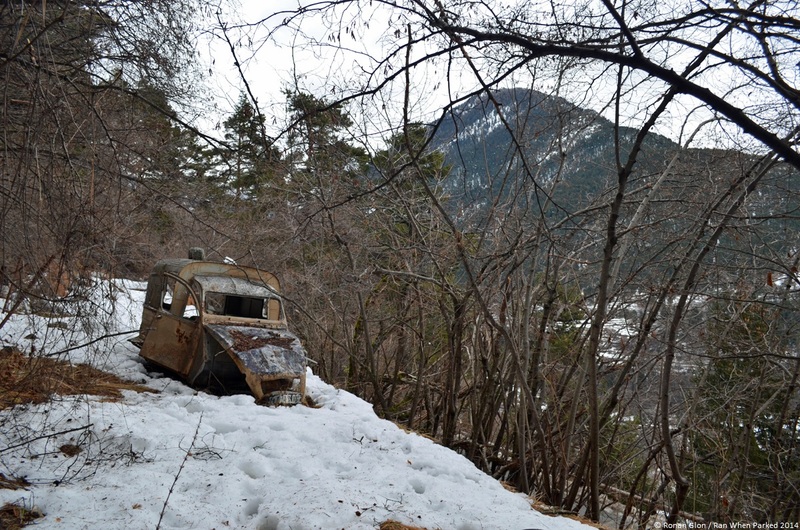 This Citroën 2CV AK400 is ending its life on a narrow strip of land located about 15 feet above a small road in the French Alps. The van is nearly invisible from the road below because its faded beige paint job allows it to blend in with the trees that surround it. The license plate number indicates the 2CV was built in 1972 but we can’t tell when it was last registered because the windshield is gone, likely smashed by the same vandals that graffitied the car and threw large rocks at it. The 602cc air-cooled flat-twin and the four-speed manual transmission have both been removed, and we’re certain the van was driven up to where it’s parked and stripped on location. It wasn’t towed up because there isn’t enough space behind it to turn around and the path leading up to it is far too narrow for a tow truck. Although local governments are starting to scrap abandoned cars in the area, this 2CV AK400 will likely stick around for at least the next decade. Not only is it fairly well hidden, but the road that leads up to it has deteriorated over time and accessing it with a car – let alone a van or a truck – to pull it out would be a difficult endeavor.